Brussels gets a lot of attention. 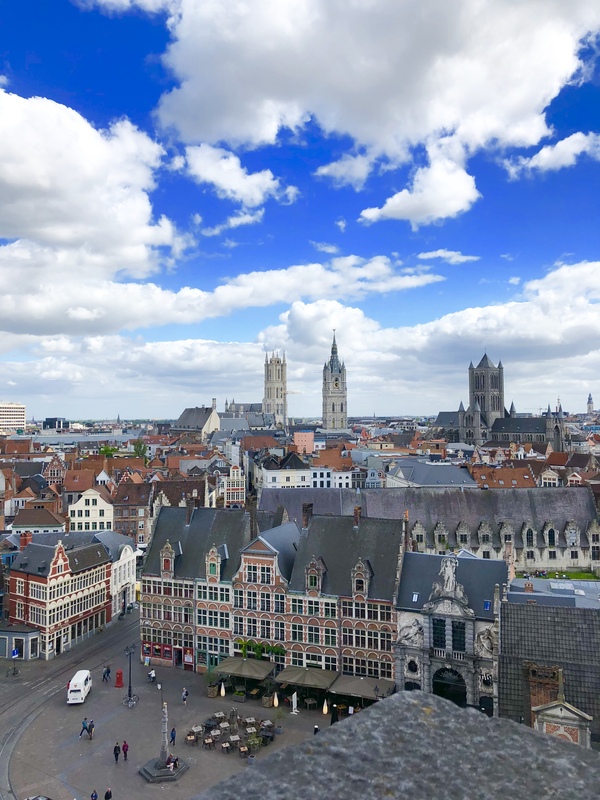 After all, it’s the capital of Belgium, the de facto capital of the European Union, and is known for its historical and architectural landmarks. 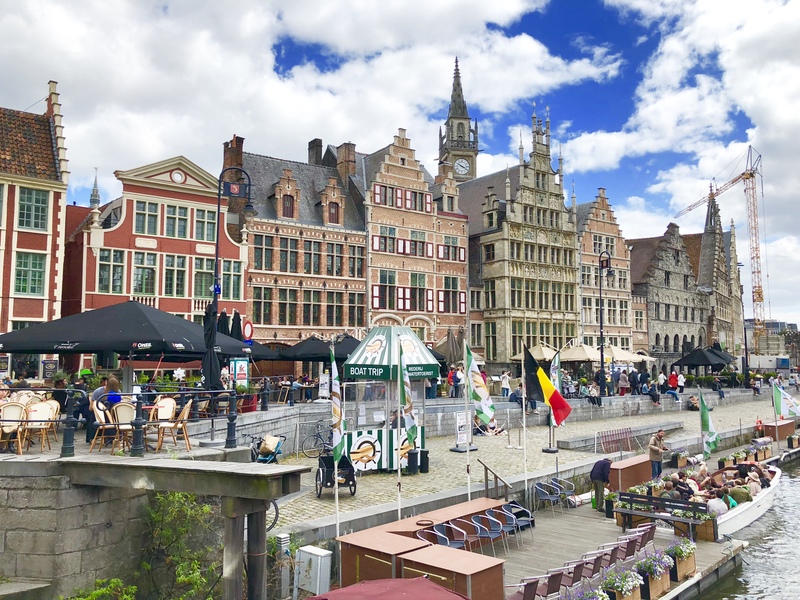 But, I’d argue that you simply cannot experience the true essence of Belgium until you get out of the huge city and visit some outlaying villages. 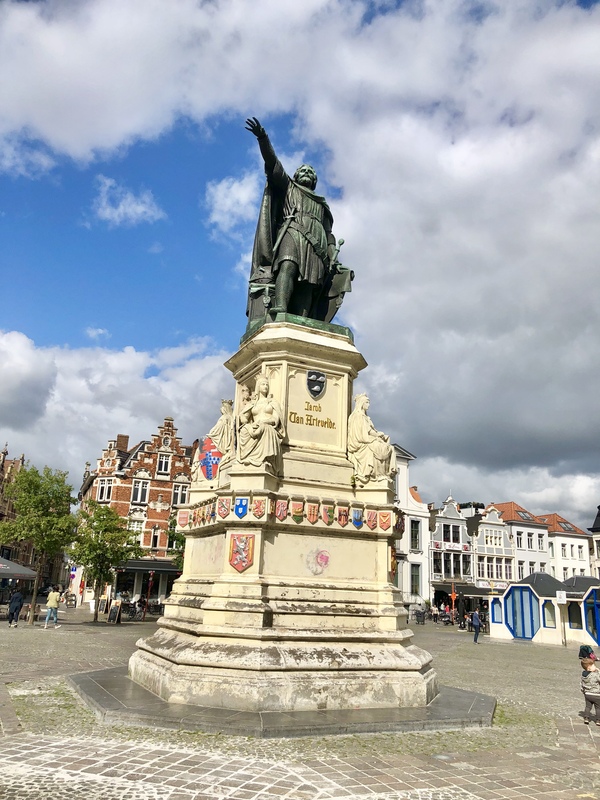 And so, I booked day trips to both Ghent and Bruges (a upcoming post) — two of the most popular choices — to see more of the old-world charm for which this region is known. 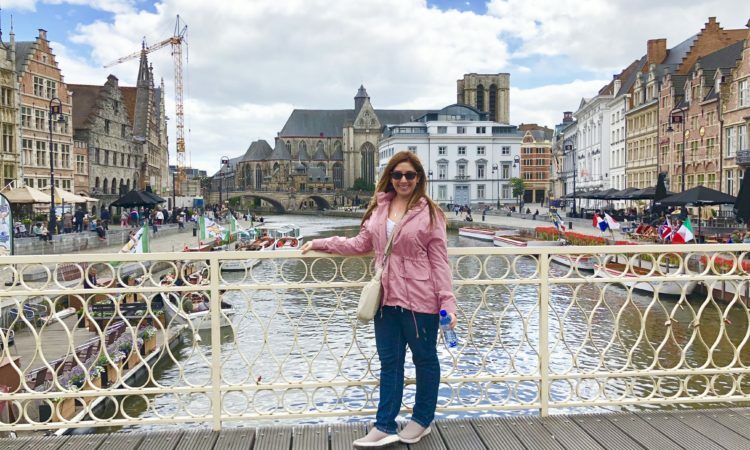 From the Brussels city center (Bruxelles-Midi), it’s an easy train ride into Ghent. It only takes about 45 minutes through the Belgian countryside, and costs less than €10. On the journey, you can pass the time staring out the window at farms, windmills and cute little houses. Once you arrive at the train station, you’ll hop on a local tram that takes you into the heart of Ghent. Ghent was considered one of the most powerful cities in northern Europe during the Middle Ages (larger than London and second in size only to Paris), and still has ample evidence of its time as a medieval empire (more on this in a minute) — but the vibe today is a much more charming and fairytale-like version. 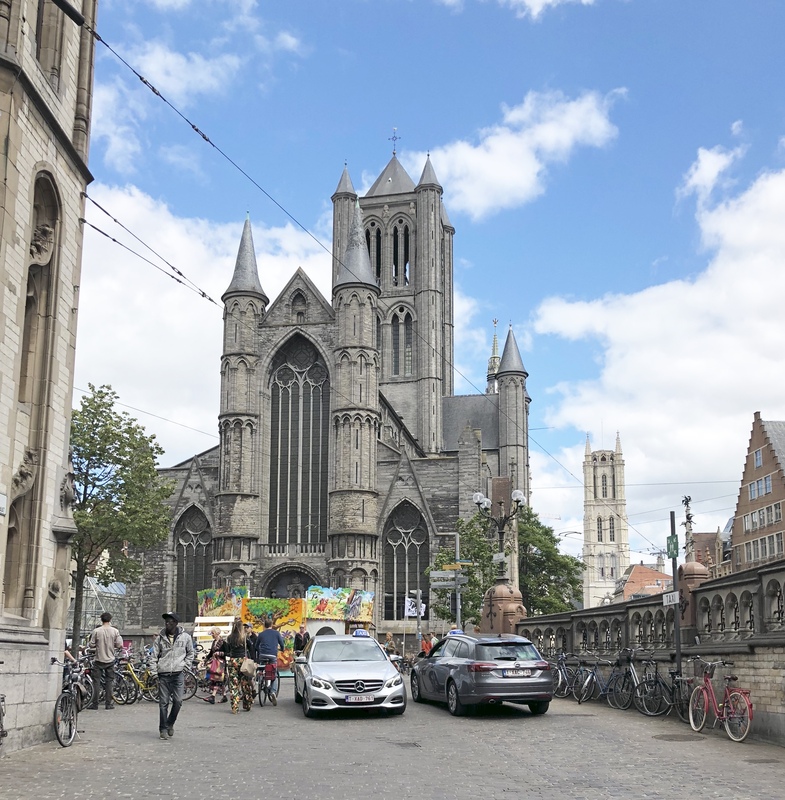 And because Ghent sustained very little damage during World Wars I and II, its historical heritage has remained surprisingly intact. 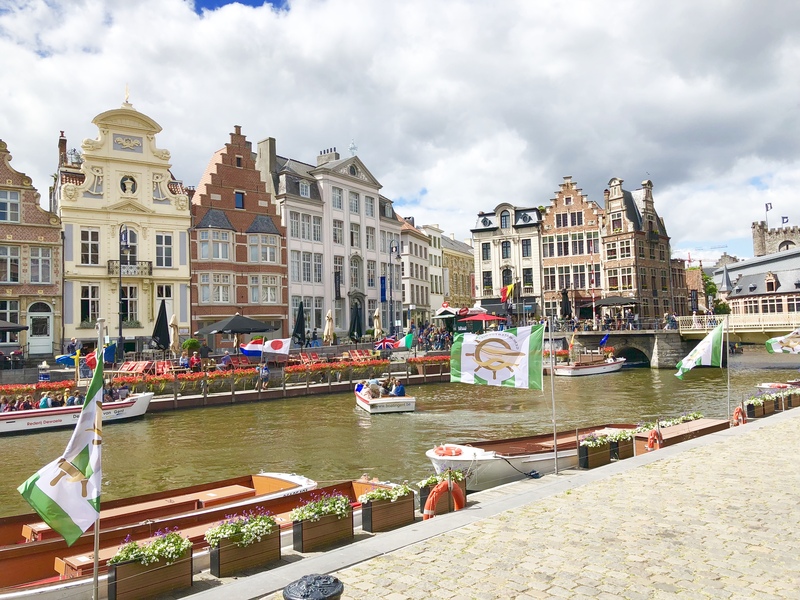 Like many great cities in this part of the world (think: Amsterdam and Venice), Ghent is situated along winding canals. As with any city surrounded by various waterways, a boat ride is one of the best ways to see the sights. 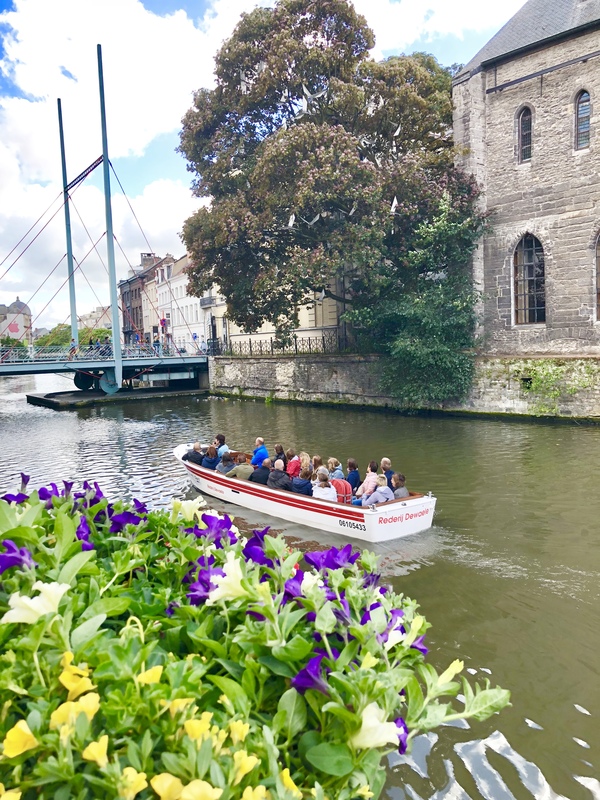 There are various tour companies to choose from, and you can purchase tickets down by the Leie River in the area known as Graslei and Korenlei. Be sure to dress for the weather (although they do offer some closed-roof vessels), and enjoy all of the architecture around you as you sail these calm waters. 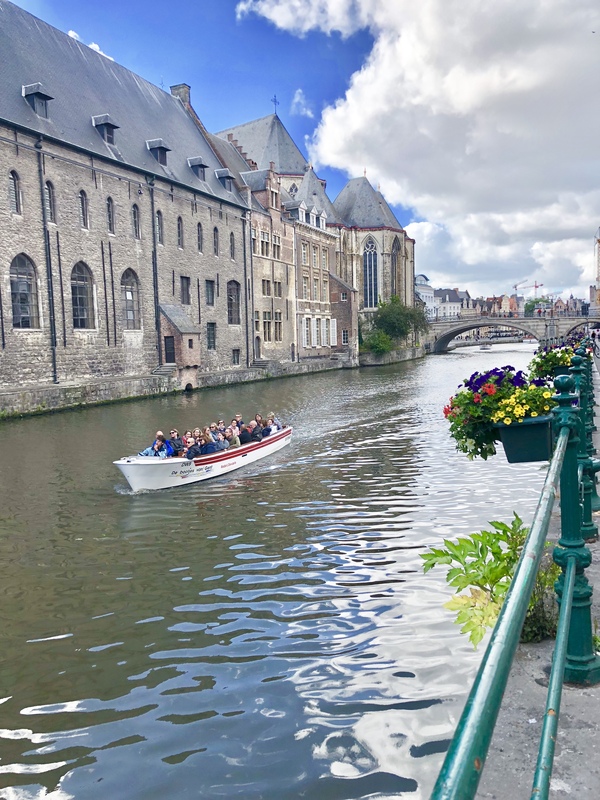 Pull out your cameras, as this is undoubtedly the most picturesque spot in all of Ghent (and quite possibly Belgium). In fact, one of the best ways to relax, people watch, and interact with the locals is by sitting at a café patio along the banks of Graslei or Korenlei. 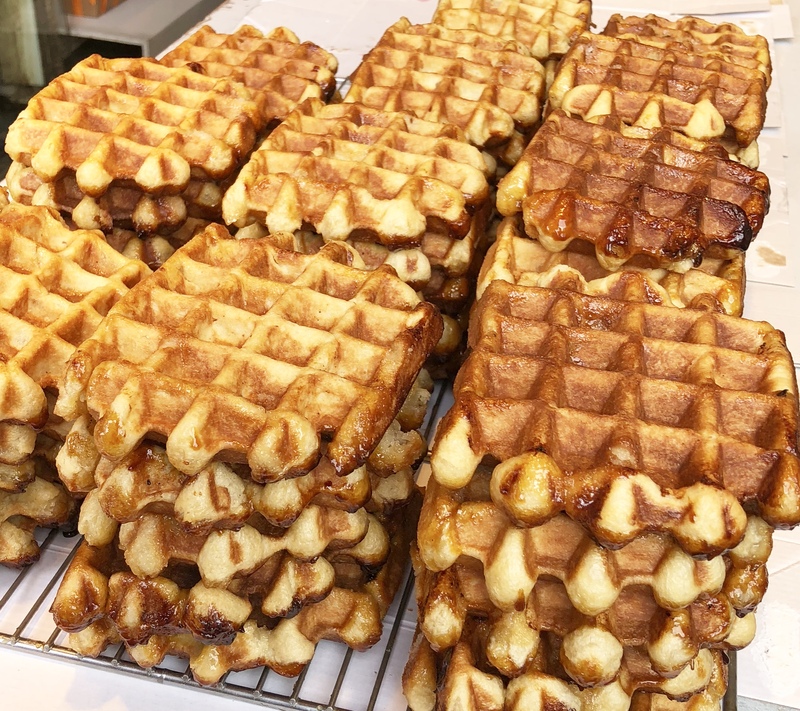 Either sip a Belgian beer, or choose a waffle (my personal favorite) and cup of coffee. 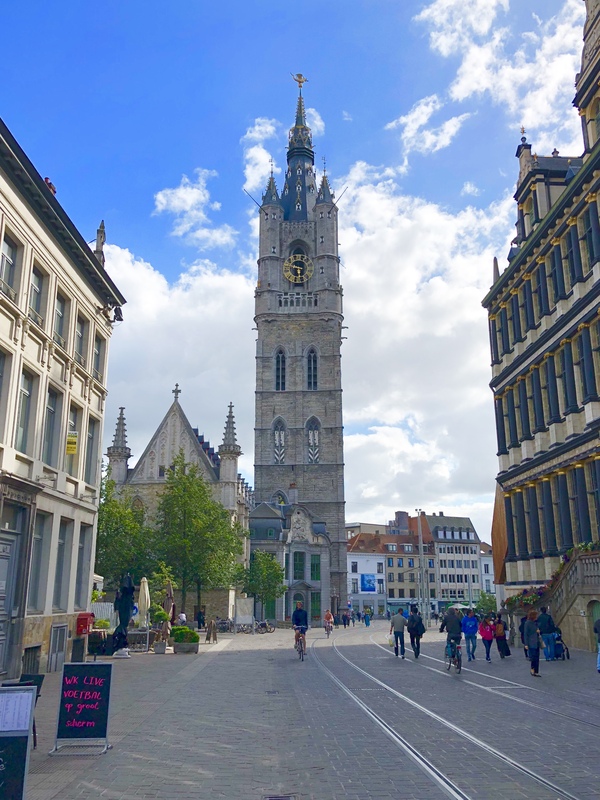 The building fronts offer exquisite displays of architecture — though most date back to the Middle Ages, the monumental facades were updated in the late 1800s in anticipation of the World’s Fair (which Ghent hosted in 1913). So where exactly is this IG-worthy hot spot? Just locate St. Nicholas’ Church (it’s hard to miss, but ask a local if you need help — they are friendly and almost everyone speaks English) and walk down the driveway in front of it (toward the river). Graslei is the grouping of buildings located on the right bank of the Leie River, and Korenlei is on the opposite bank. And if you’d like to visit both sides, you can simply walk back and forth over St. Michael’s bridge. 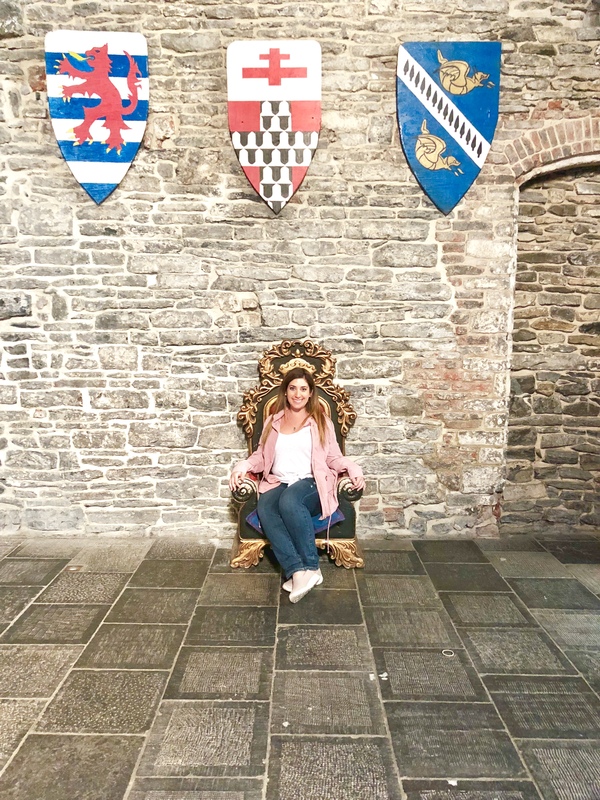 Ready to get your Game of Thrones on? While I can’t promise you dragons, I can promise a moat, a history of gruesome murders, and a tour you definitely don’t want to miss! 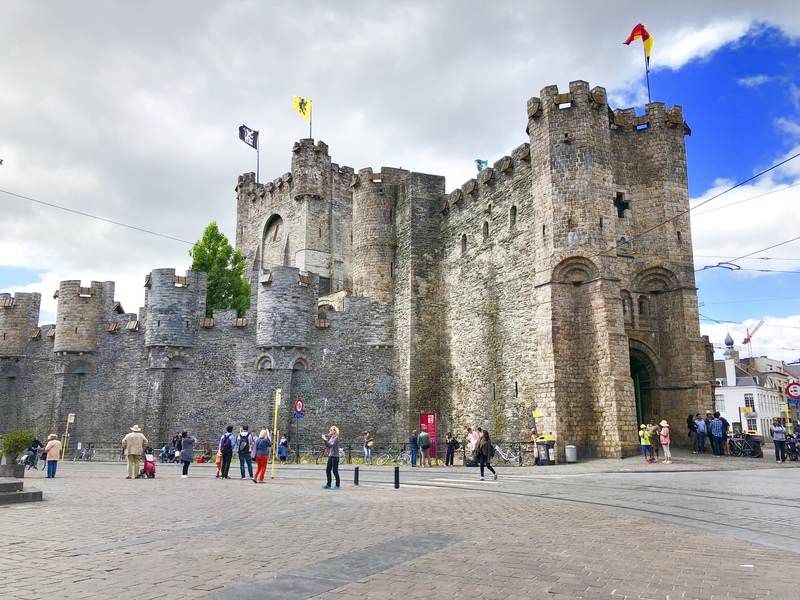 Now a museum, Gravensteen Castle (also known as the Castle of the Count) was designed as a defensive fortress in the Middle Ages — that probably explains the moat. While it was originally constructed for Count Philip of Alcase, it eventually became a prison and courthouse. And this is when things went very dark and twisty in the sweet town of Ghent. I recommend the self-guided tour through the castle, as the signage was easy to follow. 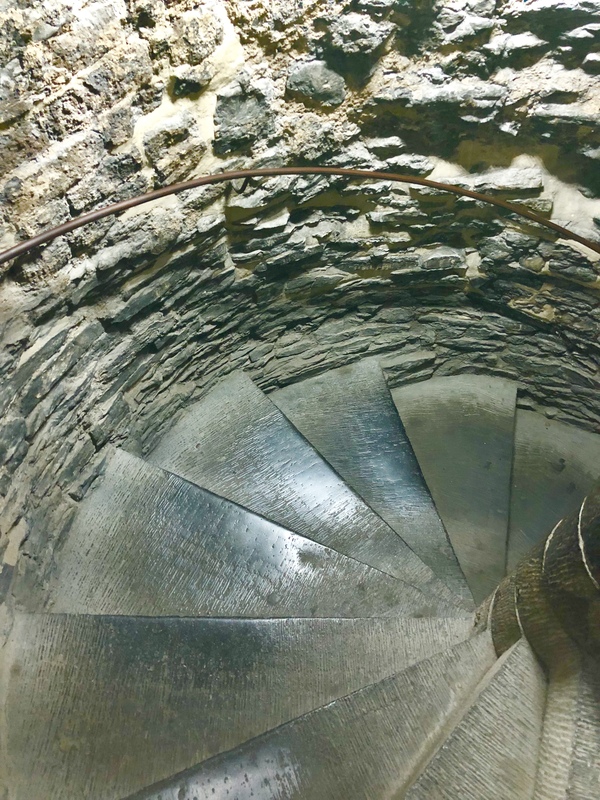 You wind your way up many stone staircases and in and out of a maze of rooms that reveal the building’s history. 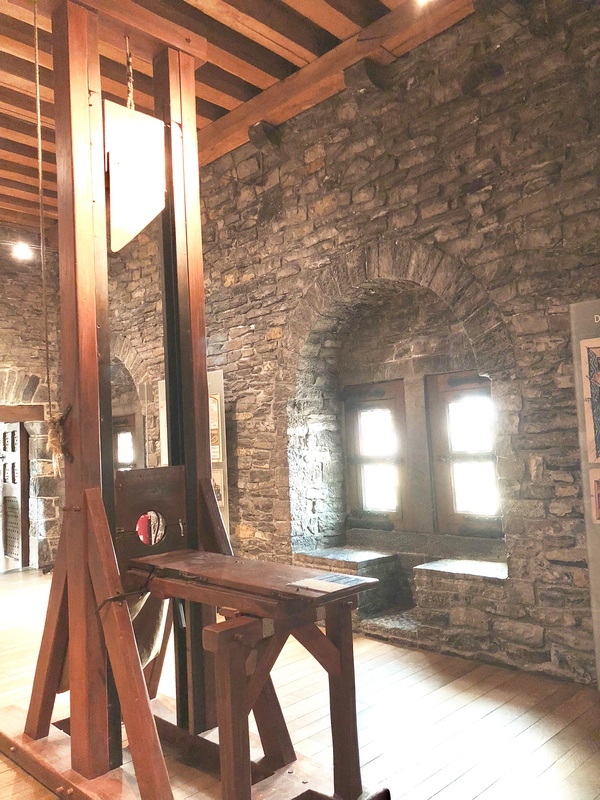 For instance, there’s a super creepy room with a guillotine smack dab in the middle — while it’s only a replica, it comes complete with the original blade! 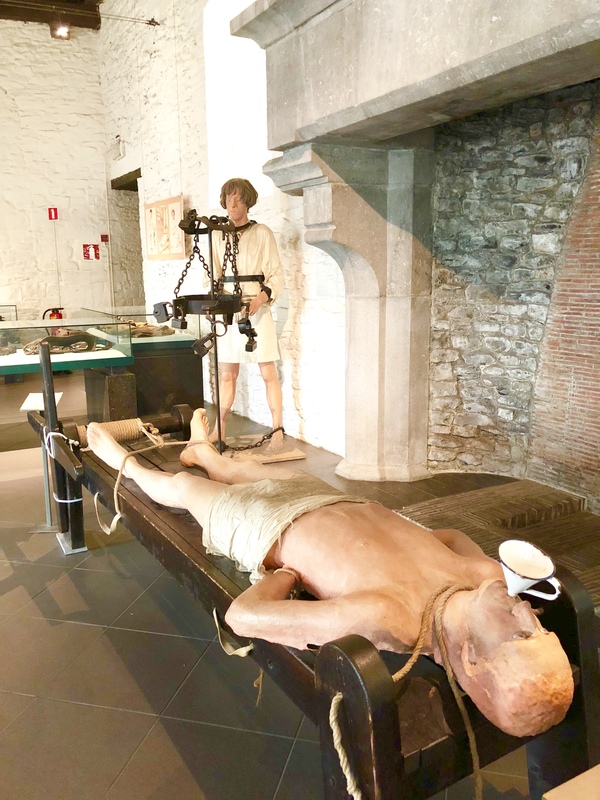 You’ll also see other medieval torture devices that were used on the prisoners, along with mannequins that demonstrate how these tools were used. There’s also an entire room of weapons (swords, daggers, spears, lances, and crossbows) and armor. Warning: You’re probably going to end up with barbaric nightmares after this tour. My favorite part of this castle happened once we climbed all the way to the top: the roof. 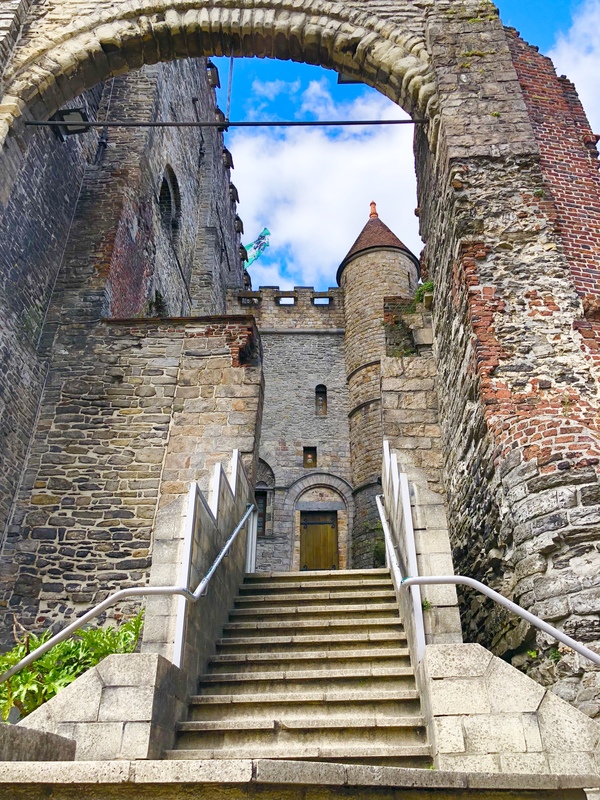 Up here, you have the most magnificent views of Ghent — and the fresh air and sunlight will leave you incredibly grateful you aren’t imprisoned in this castle. 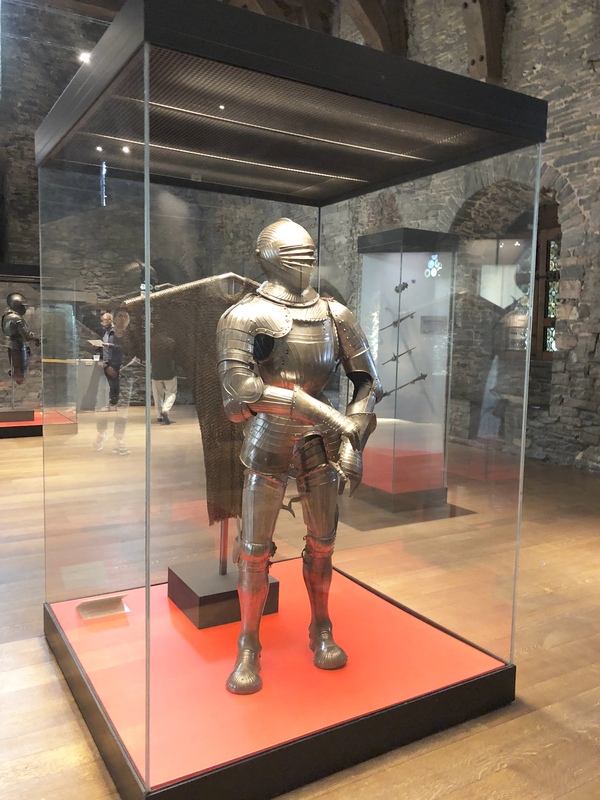 But honestly, the tour was a great way to truly understand the horror of the Middle Ages — no history book could paint these images in your head the way seeing it up close and personal does. 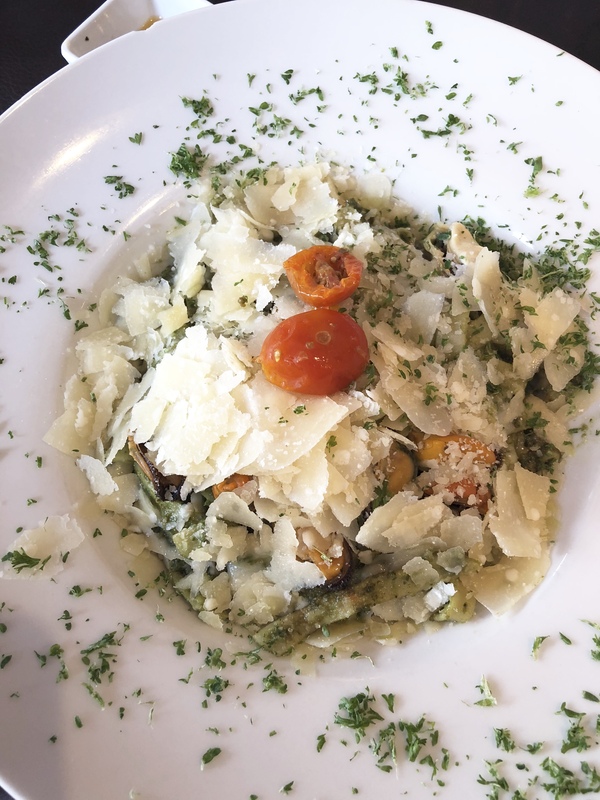 Now that you’ve worked up an appetite from all those castle stairs, it’s time for lunch. There’s no shortage of restaurants and cafes to choose from, both in the city center and along the river — and many offer outdoor seating options, which is the perfect way to enjoy a meal on a beautiful day. However, since it was an unseasonably cool and windy day when I was there, we randomly chose a spot called Vaudeville Brasserie because the indoor seating looked so warm and cozy. 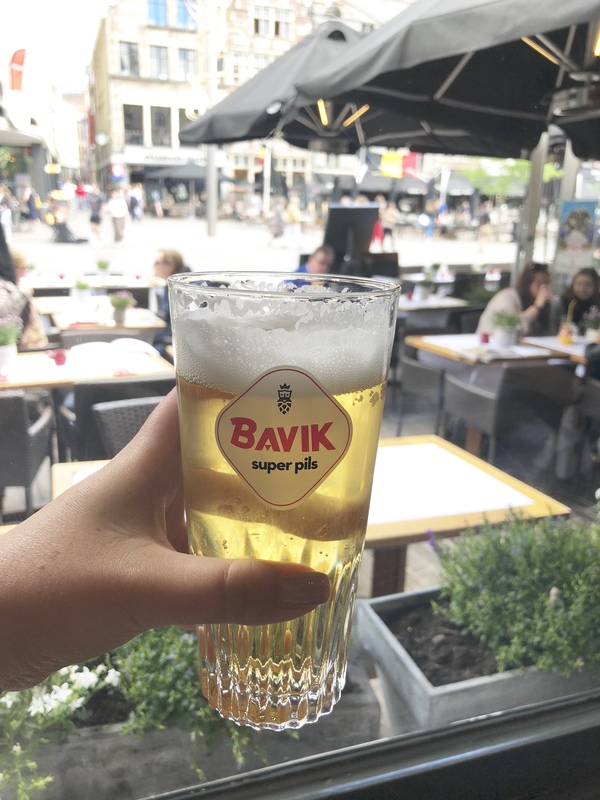 No meal in Belgium is complete without a beer, so we ordered Bavik, a Belgian pilsner. It definitely hit the spot! The tagliatelle pasta with shrimp was just what I needed to regain some energy after a full day of touring, but I have to admit I was kind of jealous of the local woman sitting next to me, who was eating mussels and frites. Next time, I’m ordering those. Looking for a little dessert? 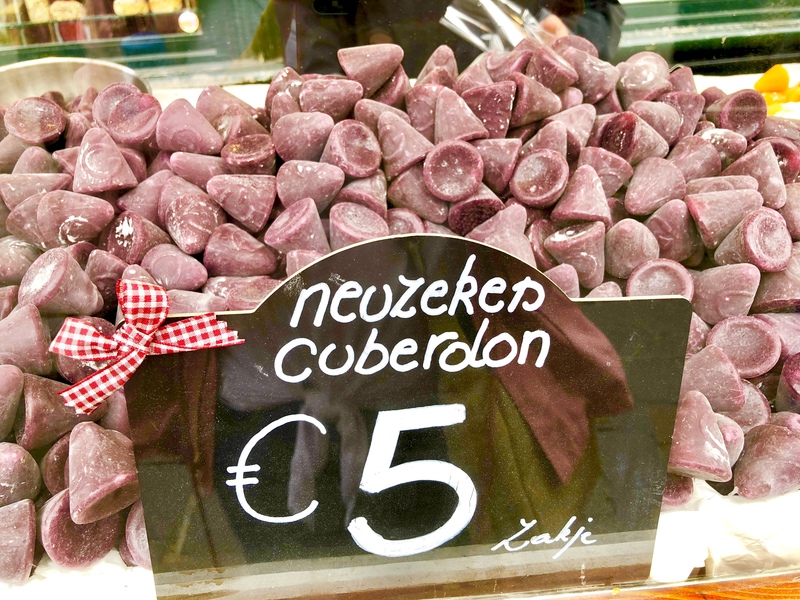 Cuberdons — cone-shaped Belgian candy that are kind of like a chewy gummy with a gooey center — are a can’t-miss. 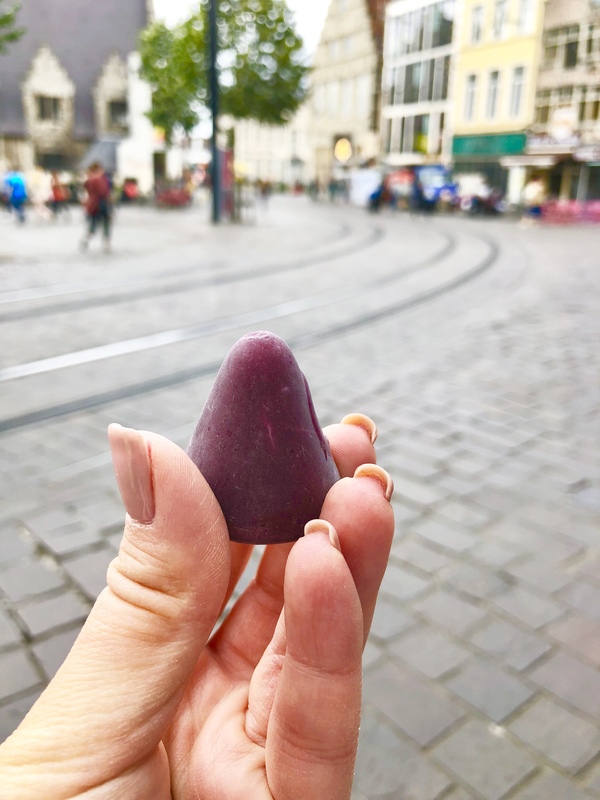 There are plenty of colors/flavors from which to choose, but if you want to try the most traditional version, choose the purple (raspberry). You’ll find old-fashioned carts around the city selling them — go ahead a buy a bag! 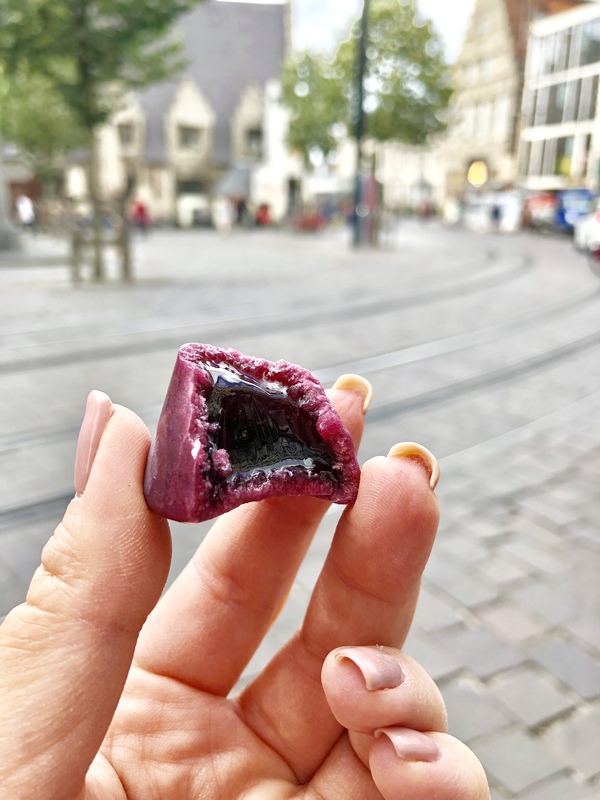 They are a sweet snack to help keep your blood sugar levels up while touring Ghent (and they last about 2 weeks before the sugar starts crystalizing). Sounds like a pretty perfect day in a charming little village, right? It was! 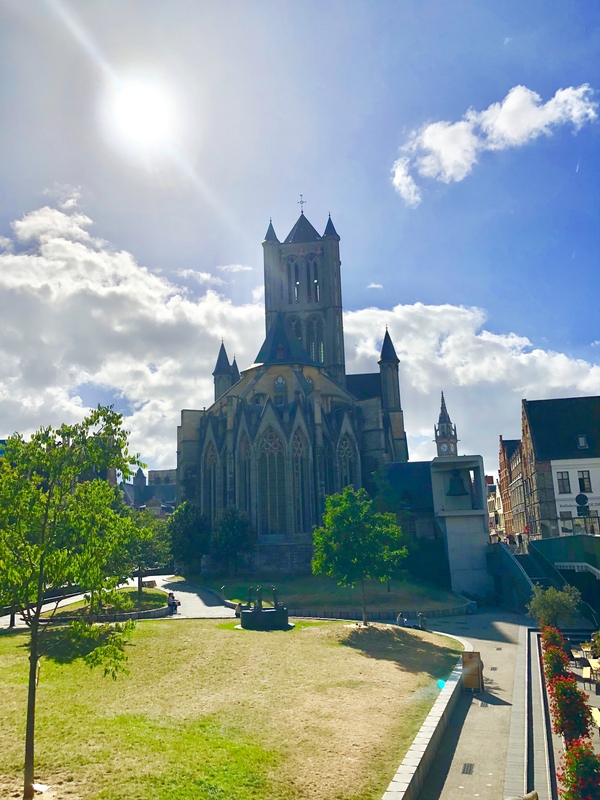 I highly recommend making time to see Ghent if you’re in the area. Plan on arriving early in the morning and staying only until late afternoon, to make the most of your day. Why? Because come 6 p.m., we honestly couldn’t find a single place to have dinner — and we were out of cuberdons and totally starving! As we walked up and down dozens of streets, looking for literally any place with food, every restaurant kept telling us that their kitchen was closed and they were only serving drinks. When we asked one particularly friendly restaurant manager where the heck people eat dinner in this town, he replied, “We eat dinner at home.” Oh! Well, who can argue with this lovely Belgian lifestyle?! On the very hungry train ride back to Brussels, I couldn’t help but marvel at a society where everyone apparently ate dinner at home with their families every night. Sounds so wonderfully traditional! 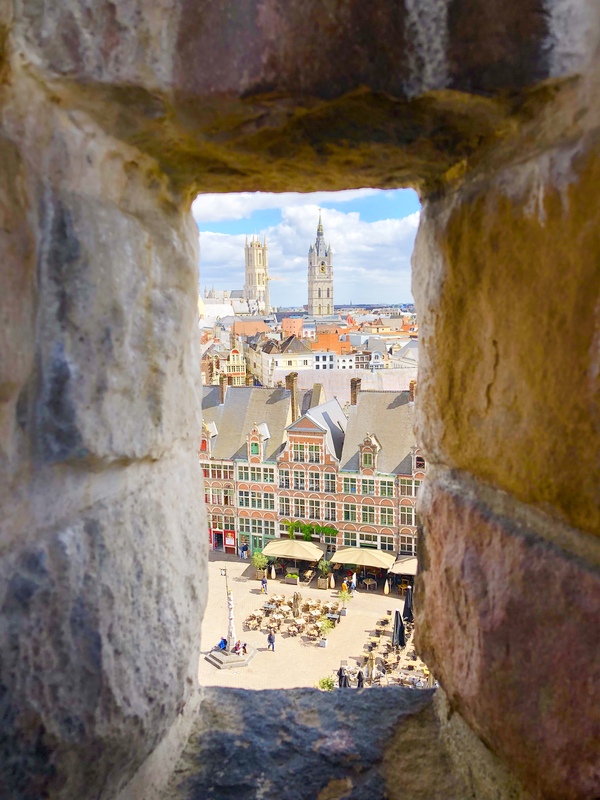 Who else wants to move to Ghent and live a utopian, modern-day Medieval lifestyle? If your hand is raised, I don’t blame you one bit. I’ll see you there. What great details and finds. Truly not a place on my radar, until now. Definitely interested in visiting after reading through everything you shared. Thank you! It’s such a great step back in time! 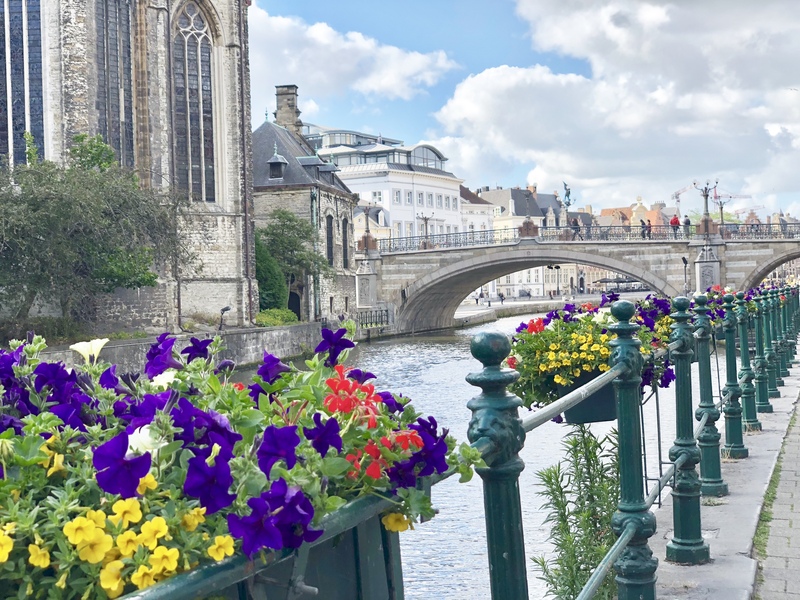 You’ll love Ghent! 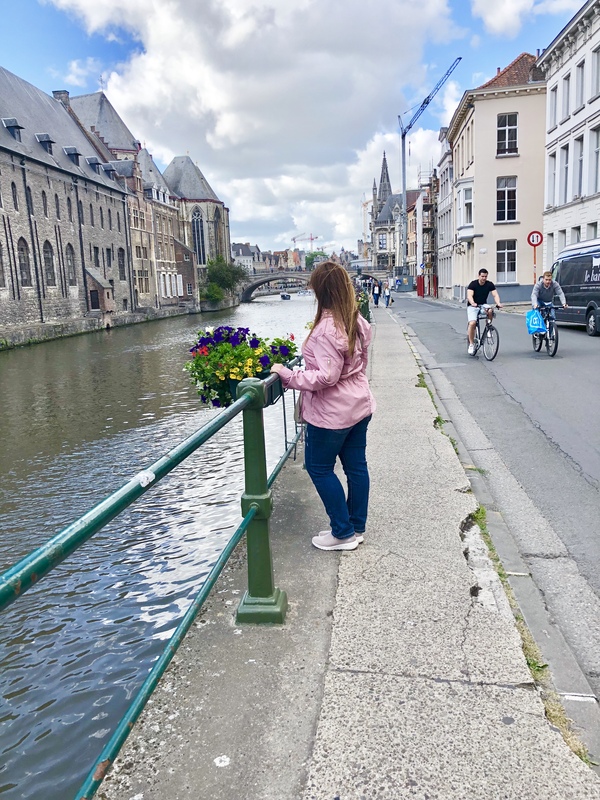 And stay tuned for my upcoming blog on Bruges, which is another adorable day trip from Brussels! 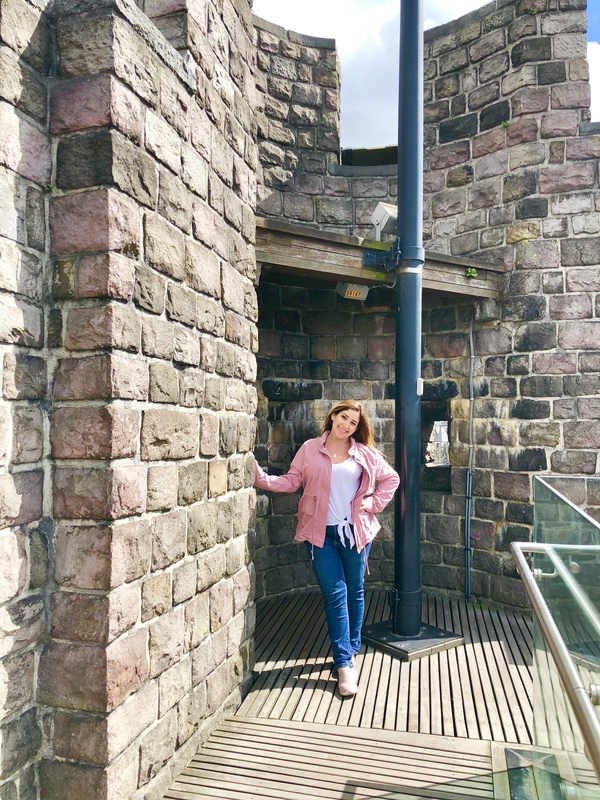 Jill, you have a way of stirring up my desire to travel abroad… your photos are beautiful and the details almost make me feel like I’ve been there myself (almost). I’m looking forward to your next post! Thank you so much 🙂 I’m so glad to hear this! Oh yes, I remember all of this, and that castle was spectacular! In fact, I’d like a waffle and a cuberdon, thank you very much! Perhaps we have a business opportunity in the U.S. … a Cuberdon & Waffle Cafe! Yum!